Here’s an idea that you may want to try: instead of trying to think of just one window treatment to do it all, think about using two or more window treatments that can complement each other. Each treatment can serve a specific purpose and when combined, all of them together can give you the overall effect you want. 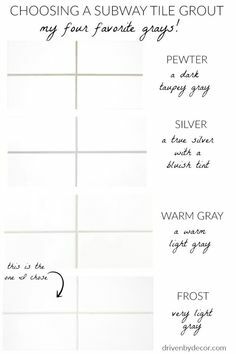 If you try this approach, I think you’ll find a solution that you’ll love and the result will be a more professional, “finished” look. And as an added bonus, by using a combination of treatments, you’ll have a unique design! And here’s something that I’m sure will surprise you: in many cases it will be less expensive going this route than trying to find one “super window treatment” that will do it all. I’ll go over a project I recently completed to serve as an example and hopefully you’ll get some ideas you can use yourself. This particular client had a set of wood blinds they wanted to replace to have a more updated look. 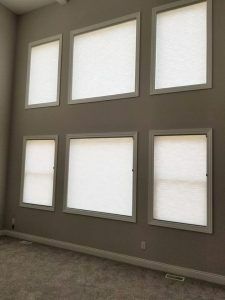 The window opened out to the backyard and they wanted to have privacy as well as light control, so they definitely needed a window treatment that was functional that would accomplish these tasks. 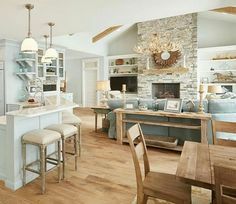 This window was in the family room and they wanted to use the room even more than they had been, so it was important to them that the room had a warm and cozy feel to it. I noticed that there was a large entertainment center next to the window. This entertainment center was very tall, and made the window appear smaller than it actually was. 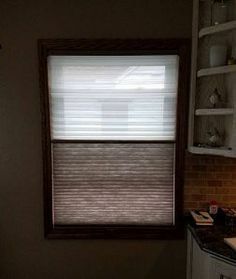 So, we needed to replace the blinds with something that would have privacy and light control and at the same time, make the room more inviting so the family would want to spend more time there. So, here’s what I came up with. Replacing the blinds with a new set of wood blinds seemed to be a good place to start. 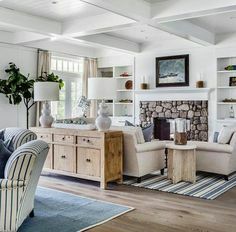 They’d complement the wooden furniture and accentuate the wood molding around the windows and bordering the ceiling and floor throughout the room. They’re a practical solution for the privacy and light control issue. They’re easy to maintain and keep clean and they’re affordable. So wood blinds seemed like a great choice. But there was still more to do. Then I recommended a valance to “balance out” the window. What I mean by that is I made sure the valance was tall enough to reach just below the ceiling. Remember that tall entertainment center? Making the valance this tall would help offset the height of the entertainment center and make the window appear larger. 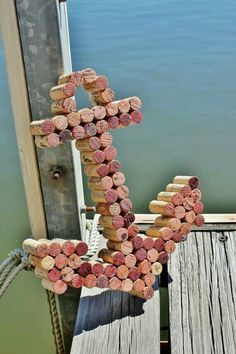 This would help make the window area more of a focal point of the room. The type of valance I designed is called a “mock Roman valance”. 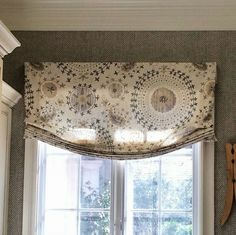 This is a valance that has “hobbles”, like you would find on a Roman Shade. But it doesn’t operate like a shade ,so it’s less expensive than a Roman Shade. (Tip: if you want the “look” of a Roman Shade without the cost, see if a “mock Roman valance” will work for you.) 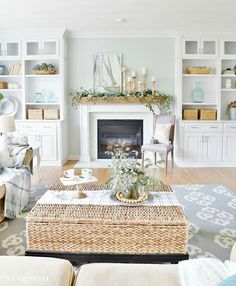 The pattern I selected was a small leaf pattern that seemed to blend in nicely with rest of the room. A “Mock Roman Valance”, to accentuate the window and add additional dimension to the room. So there you have it – multiple window treatments, layered together to provide a practical solution and an inviting atmosphere. I’d say that’s a family room ready to be lived in! OK, so let me hear what you have to say: What do you think of this solution? What ideas do you have? This entry was posted in Blinds, Curtains and Drapes, Draperies and tagged in drapery panels, rod pocket, valance, window treatments, wood blinds.